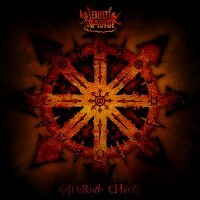 I cannot believe that after I heard QUO VADIS’s new album “Infernal Chaos” that this band left us with only a single record in English. There were always certain ways when bands tried to be more innovative in their approaches, yet, not too many of them succeeded on that hard task. In the case of QUO VADIS, it is something else entirely. For years, this band has been spreading their diverse style all over their local scene. However, with the breakout of their first record in English, since 1986, they let the rest of the world take a peak on their offerings. Beyond maturity, which is commodity of the band, the diversity kills. Swaying from Prog to Death to Thrash to Heavy might be too demanding for the writer, yet, not overbearing for the listener. At first, when I heard one of the better songs of the album, “Blood For Oil”, it sounded to me more than just a Thrash Metal record. I found a sort of complexity, sort of progression, which I liked to hear and it kept me going on listening. With a rather sharp modern sound, assorted vocals and an array of mixed sub-genre riffs and passages, nothing has been left hidden with QUO VADIS’s accomplishment. The name “modernity” is mostly associated with the band’s production. The material itself is energetic, partly emotive, filled with amazing mixes of negative thoughts and criticism. These guys entered their political means quite skilfully under the cloud of good music, detesting the remains of communism is only a part of their game. When I heard that these guys are from Poland, and playing a kind of Extreme Metal, I thought first of a thrashy version of BEHEMOTH or at least VADER, don’t know why, it just came over my mind. However, instead of BEHEMOTH or VADER I found rather strong similarities to a wicked version of NEVERMORE. QUO VADIS shares many traits with the American band and show great promise on showing the listener ways to bang he / she’s head or to just sit down and think deep down on what really troubles society. Other than their affiliation, QUO VADIS plays some very special breeds of rhythms, something like Balkan or Middle Eastern styles, which are great patents and amazing followers of their efforts. However, some of band’s songs are rather hard to comprehend. That is because of the fact that it seemed that QUO VADIS did not quite believe in making things smooth. Nevertheless, the album is headbangable. Beyond that, “Infernal Chaos” is not your average old school Metal album, whether Thrash or not, it is a home for both modern and classic lovers (extreme of non-extreme). Maybe it is rather tough to categorize this album as a memorable experience, yet, this album is more credited by the creativity that surrounds it.With highlights as “Blood For Oil”, “Bomb And Fire”, “Dreams”, “East Vs West”, “Great Russia”, “Nimue” and the song for the hated daddy, “Evil Dad”, my opinion is well proven - Not memorable all the way, yet, constructive in approach and inspiring. QUO VADIS should go on and make more of those, in English please. Good luck guys!